A breakwater is a protection for a harbour. 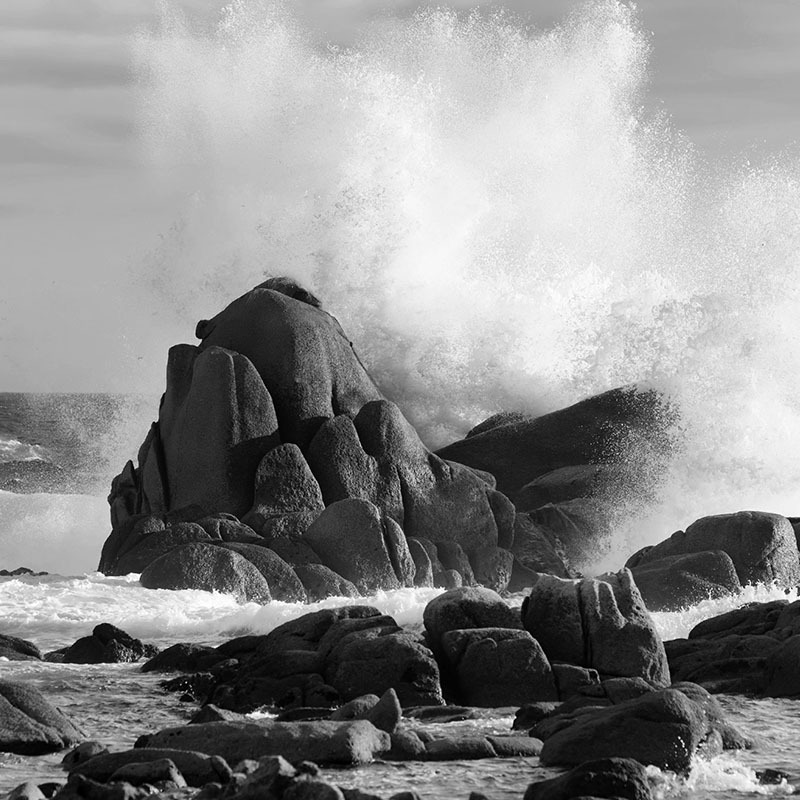 It may be subjected to excessive force when any storm or hurricane strikes a port. SF Marina floating breakwaters have been tested live and in full scale by a hundred years of storms, hurricanes and typhoons. Since the first floating breakwater was installed almost 40 years ago, SF Marina has installed floating breakwaters in a wide variety of sites often exposed to adverse conditions, in all climate zones and extreme locations. Our floating breakwater range has been severely tested, and from these occasions we study, learn and improve our technology. Each breakwater is unique and therefore each pontoon is custom built only after the client has approved the drawing, called a “shop drawing”, which means that our customers get their pontoons built according to their specifications. It is with great pride that we present our current breakwater range. It is the sum of all experience we have gathered from the first breakwater installation. Our confidence in our breakwaters comes from knowing that our floating breakwater range has and is being tested every day and from these occasions we study, learn and improve our technology. SF Marina floating breakwaters have been tested to the very limits by bespoke storms, hurricanes and typhoons in all parts of the world. Since the first floating breakwater was installed almost 40 years ago, SF Marina has installed floating breakwaters in a wide variety of sites exposed to harsh conditions, in deep and shallow waters and in all climate zones imaginable. 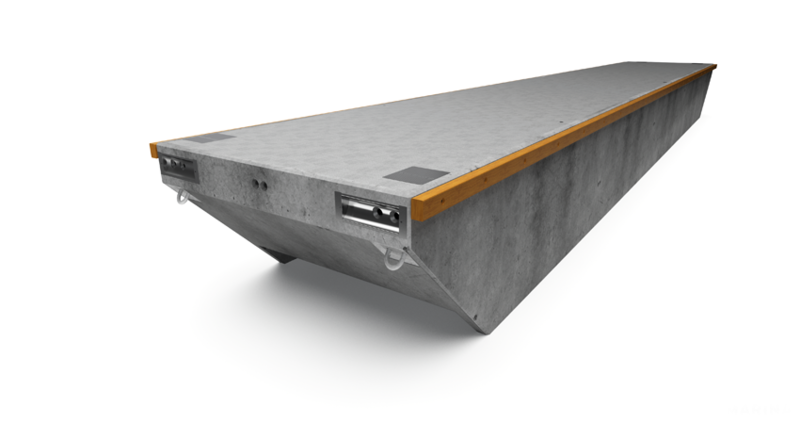 SF Marina delivers a complete range of floating concrete breakwaters with widths from 3 meters to 10 meters. Our design team will assist you in designing the correct breakwater configuration for your location as well as engineering a reliable and cost efficient anchoring plan for your breakwater. SF Marina breakwaters are designed for lowest possible maintenance cost, with easily accessible inspection points, easy to replace connector wires and stainless females and bolts. All concrete pontoons will attenuate waves, but it is very important to distinguish between a floating breakwater and a concrete pontoon. 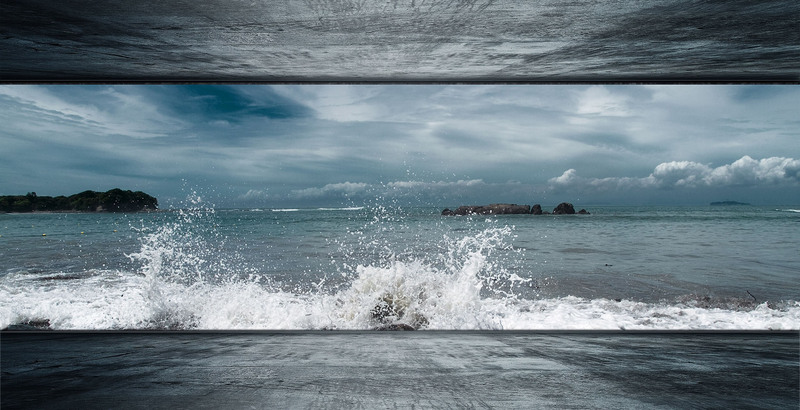 Floating breakwaters and concrete pontoons differ significantly in all the three vital criteria: strength of reinforcement, strength of connectors and anchoring. A normal pontoon will mainly handle forces from direct loads and wind forces. A breakwater is designed to restrain the movement of the floating breakwater elements it is connected to. Strong reinforcement around the mooring-rings. Our mooring-rings are reinforced in such a manner that the entire breakwater can be lifted by a single ring. Our coupling system consisting of access wells with heavy steel plates, stainless steel cut-outs, coupling wires packed in anti-corrosive grease and heavy rubber cylinders. The coupling system is also so versatile that we can make use of centre couplings, to eliminate torsional loads on longer piers or sections used to build specific angle solutions. Our mooring technique which is based on an anchoring system using heavy chains and concrete anchors. The chain is coupled to the pontoon mooring-rings with shackles and a “bridle ring” as shown below. It is clear from the diagram below, when forces on the chain increase as the coupling gets pulled downwards under load, the total force at the “bridle ring” causes the pontoons to be pulled together, while still kept safely apart by the rubber cylinders. The more the wind blows, the more the pontoons get pulled together. 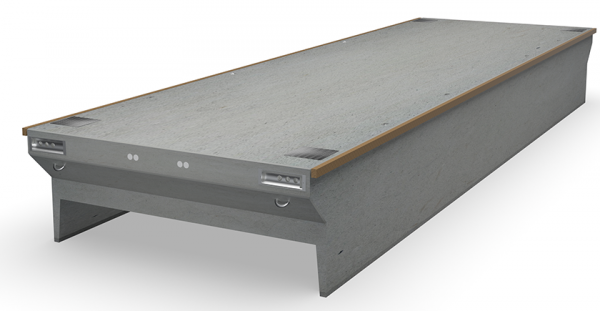 SF300 is a 3-meter wide all-concrete Breakwater. In our experience, 3 meters in width is minimum for the successful use of the turbulence chamber, “Wings,” the pontoon. SF300 Series has been developed over 35 years and is now a very well-tested product that works in exposed locations. SF400 Series is a very rigorously tested breakwater. It is used today in all the world’s oceans. SF400 Series has been under continual development for the past 30 years and has survived all of the recent storms and hurricanes that it has been exposed to. This is due to our very unique system which has been designed to absorb and distribute stress when the loads are increasing tremendously during severe storms. 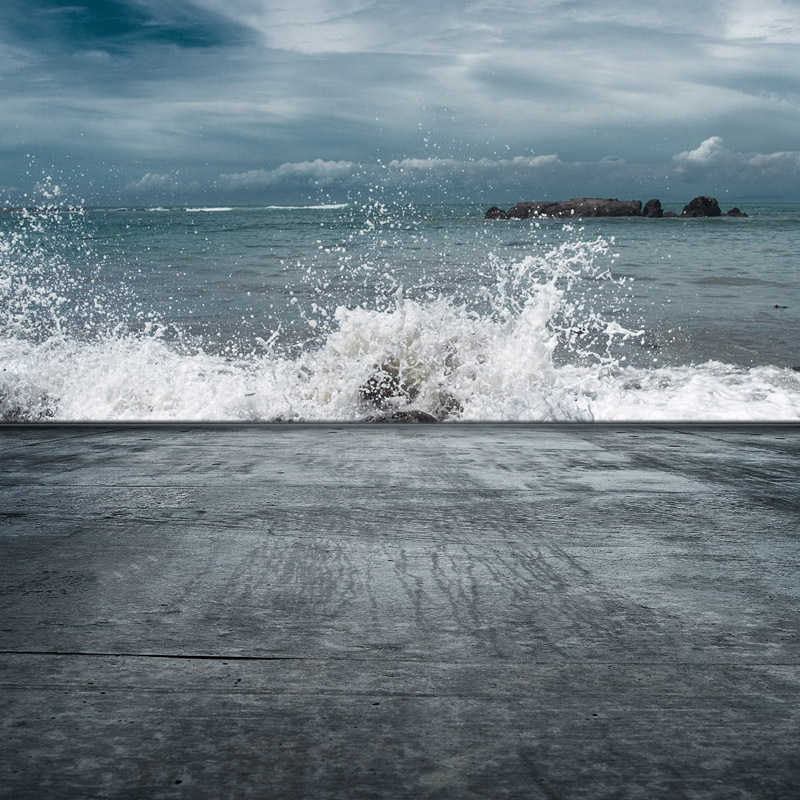 SF400 Series, like all of our breakwaters, is doubly reinforced with the market’s thickest concrete surfacing layer, which guarantees a strong pontoon with a very long lifetime. The amount of reinforced concrete in a breakwater is easy to compare with others, by simply checking the weight. The SF500 Series is a 5-meter wide super strong breakwater, often found as the outer pier protection for various port facilities. The SF500 series was initially developed for the USA’s East Coast where our installations are regularly exposed to the brutal hurricanes that plague the coast during the autumn season. That our SF500 series survives this depends on our unique coupling system that absorbs and distributes loads when the loads are increasing tremendously during severe storms. Simply put, one can say that when a SF500 breakwater is under duress, the rubber cylinders in the connectors are what handles the stress, and not the wires, so the concrete around the connectors is subjected mainly to compressive forces, and not tension. This makes our breakwater unique and our SF500 series is the foremost floating breakwater made today. We can now manufacture them at any angles whatsoever, and we can equip the pontoons with virtually any components because we basically use the same standardized technical solutions that are thoroughly tested. The geometry of this pontoons, in combination with our patented coupling and an advanced mooring system, makes our floating breakwater an excellent wave attenuator. This pontoon has been developed gradually over the years. From smaller sizes in the beginning, now reaching the width of 6 meters, it is the largest model of floating breakwater on the market. The breakwaters from SF MARINA are all-concrete pontoons with all the advantages of high stability and buoyancy. The all concrete and styrofoam construction of the pontoon produces a very high degree of buoyancy thus making it virtually unsinkable. As a result of the use of high quality materials, in combination with a thorough manufacturing process, the pontoon enjoys a long life-span. 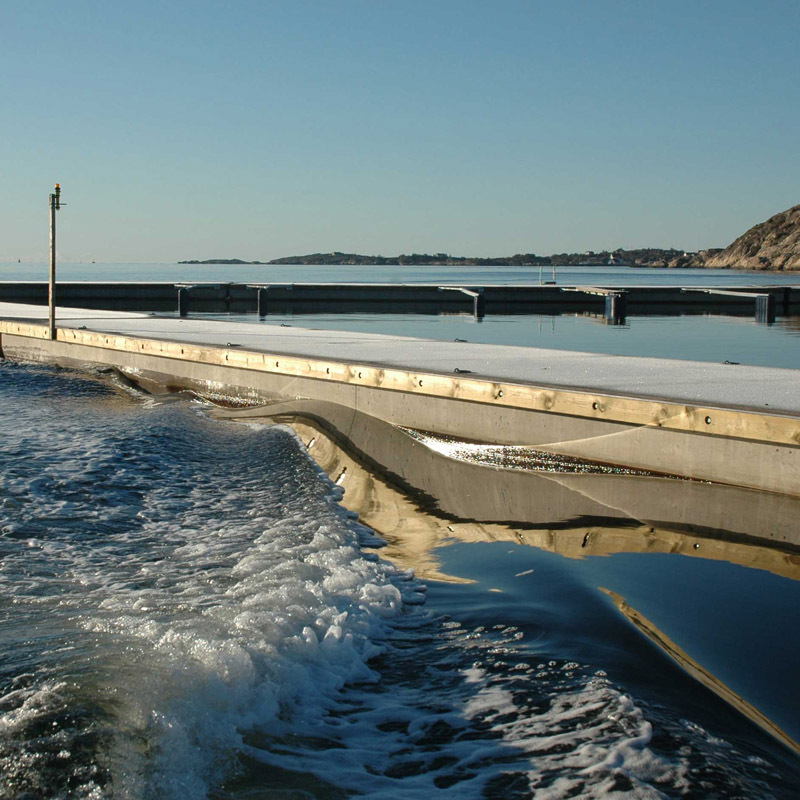 Each standard pontoon is designed to accept electrical and water supply services. Normally, the pontoons would be moored using chains and blocks. This pontoons are first and foremost as a floating breakwater. However, they can be used universally where the potential of a pontoon having high stability and freeboard can be utilized.